if there is one thing I have been living in this summer besides a bikini its a maxi dress. i seriously cannot get enough. i think i love them so much because they can be so multi-functional....you can dress them up or down, they're perfect for those days when you feel 'fat' & they're just SO comfy. Now don't think maxi dresses are only for tall girls because that is SO not true. I am only 5'3 and I don't feel maxi's make me look any shorter. I always thought they were only for tall girls, but I was proven wrong when I took the leap...& now I can't stop wearing them! 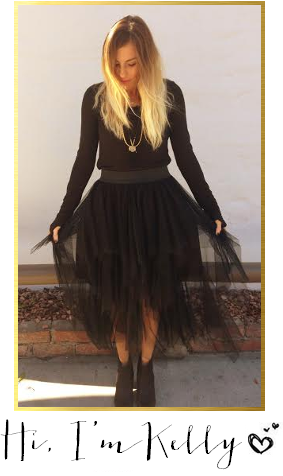 SO i was recently browsing online and came across such a cute site that has some fabulous pieces! I have been looking for the perfect jean vest forever & I finally found it at Chicnova & of course I had to pick up some 'John Lennon' inspired sunnies as well. 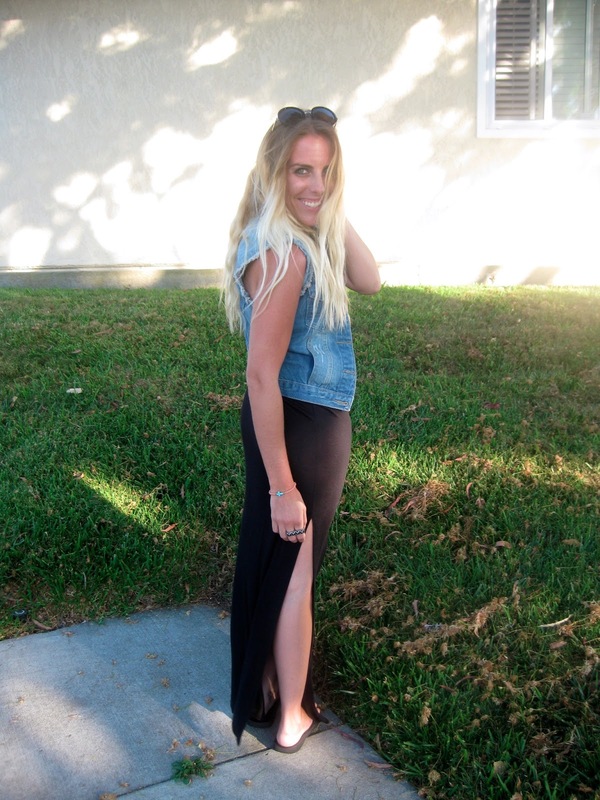 I really love the way the jean vest looked with one of my new maxi's. I really loved the 2 'faux' front pockets on the vest, but my favorite was the extra fringe around the arms. Its such a small detail, but can add the perfect amount of flare to outfit....& of course I am obsessed with the sunnies...they're so 60s. Plus they are SO comfortable and light weight. My favorite thing about this maxi though.....def the slits on both sides....i die. Have you tried the maxi trend? 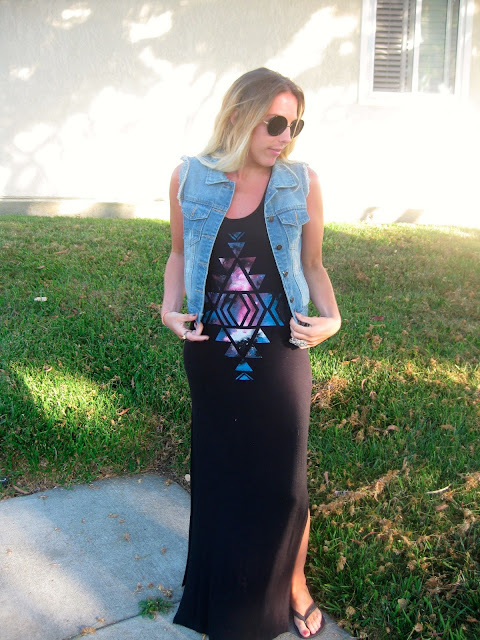 What do you think of the vest with the maxi? What is your go to outfit this summer? 1 Week Until #TheMessyProject 1 Year Anniversary Edition!!!!!!!!! I am addicted to a great maxi! I love the jean vest! I need that in my closet! Love the look. I just discovered maxi's! I bought three in one day because I figured I should get them before summer is over. your hair is getting sooo long! and I love that dress! so pretty! I FINALLY feel fashionable, because I already did something that you talked about on your blog!! I have purchased a bunch of maxi dresses and skirts this year because well, they're just fabulous! And 2 weeks ago, I picked up a jean jacket (since it gets cooler here in Montana) to wear over them! I feel like I've finally made it! LOL. you're only 5'3? I'm 5'2. I always felt maxi dresses would be made much too long for me. Have you found that many of them are too long on you? I love the dress, that slit is great! But really is there anything you can't wear? I am beyond obsessed with maxi's too! your double slit one is soooooo major I need it now! Love that you added the vest! You are always rockin girl keep it up! I live in maxis on the weekend. They're THE best. The fringe is my favorite thing about this. I have a denim vest from Gap that I just love to wear over sundresses.